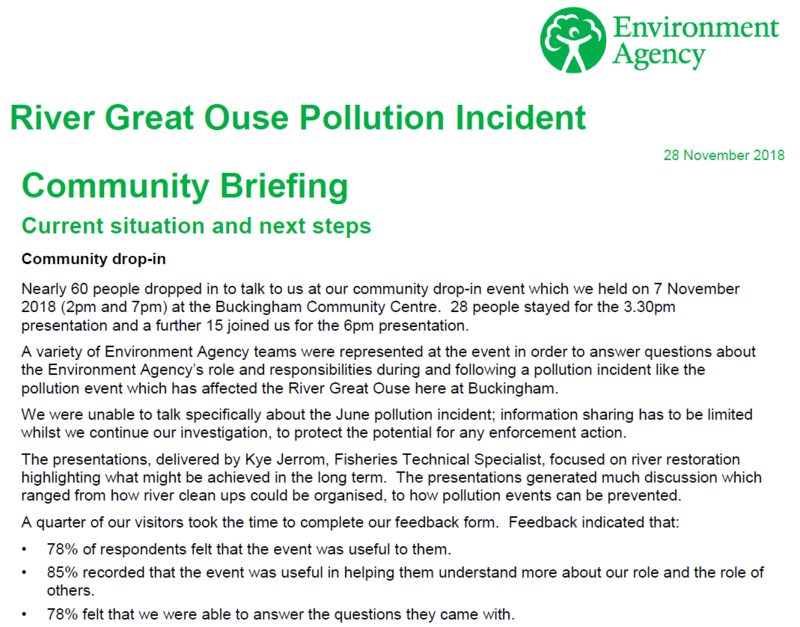 The following update has been provided by the Environment Agency, following the Community Briefing in November. Having the Environment Agency holding this open session in Buckingham was extremely useful, as it enabled residents to ask them questions directly and to learn more about the future of the River Great Ouse. Click here to read the River Warden leaflet from the Environment Agency. If you are interested in becoming a River Warden, or have any questions, please get in touch with Karen Paterson: karen.paterson@environment-agency.gov.uk The Environment Agency plans to be in touch early in the New Year with further information on the scheme. This entry was posted in News and tagged Environment agency, parks, river, river ouse by Louise. Bookmark the permalink.